Great post, I had no idea the SGV can lay claim to the first Cheeseburger! Don't forget Eaton's amazing water system in the 19th century, the Brown brothers' cabin in the hills (yes, John Brown's sons), the first test of jet propulsion (at the location of what is now aptly named the Jet Propulsion Laboratory), and the first frisbee golf course. I hate that Hacienda Heights' only contribution to this post is Fergie. I believe the rest of the Black-Eyed-Peas are from the SGV, too! 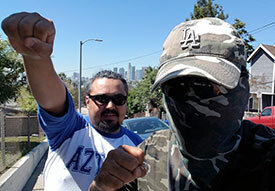 Nobel4Lit: An unspecified number of The Miltant's operatives know the Black Eyed Peas personally, and he knows for sure that will.i.am is from The Eastside (Boyle Heights); Taboo, though SGV-raised (Rosemead), was also born in Boyle Heights while apl.de.ap was born in the Philippines but lived in the Los Feliz/Atwater Village area when he arrived here. Their "home base" is actually in Atwater Village. mchean: The SGV has every right to claim Jackie Robinson as their own...but for the criteria per this post, Jackie was SGV-raised, but not born (Cairo, Georgia). Anonymous: McDonald's was born in the Inland Empire (San Bernardino). Though it was established 8 years before In-N-Out, it didn't become a franchise chain until the 1950s. 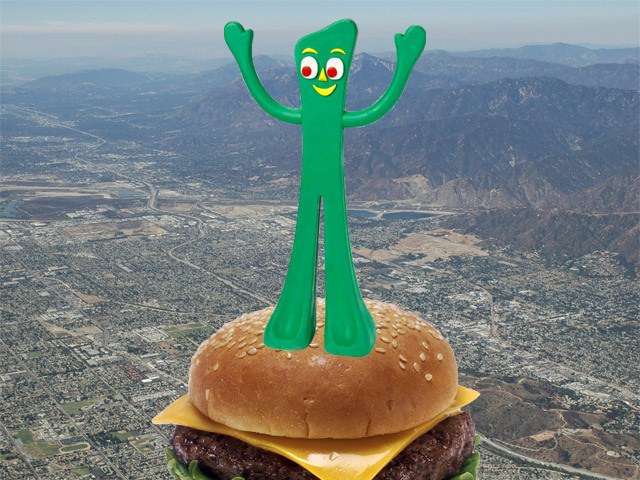 I just got a brilliant idea from your picture in this post.....there should be a huge statue of Gumby standing on a cheeseburger on top of Mt. Wilson, similar to the statue of Christ on the mountaintop in Rio De Janeiro! I used to hear as a kid that Laura Scudder and her potato chips were from Monterey Park.